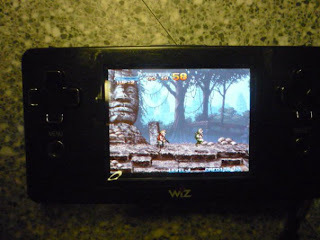 Retr0Rob's Blog: GP2X Wiz Linux Handheld First Impressions. 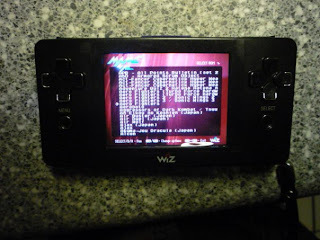 GP2X Wiz Linux Handheld First Impressions. 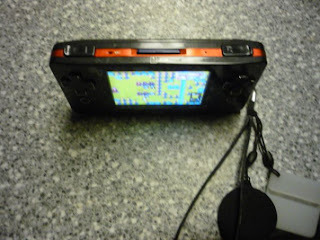 My GP2X Wiz showed up on the doorstep Friday. I bought it from the GP2X store. $150. + some shipping. 5 day turnaround... Not bad. Anyway I figured I would write down my first impressions about the system along with a few pics. The first thing I noticed is that the packaging is downright awesome. Gamepark has always had catchy packaging, but they have outdone themselves here: a heavy cardboard treasure chest with a semi-gloss finish features the Wiz logo. The words "Whatever You Want" mysteriously printed below. The color is bright and the printing crisp and clear. Sony,Nintendo and Microsoft could learn a few things from GamePark. There is almost no Engrish to be found in the manual or box. The only (slight) error I caught was on the inside flap where the advertising proclaims "Revolutionized Game System". Notice that on the front of the flap the corrected "Revolutionary Game System" is displayed. American and European companies do worse all the time. This blog does as well. very solid. It's a little heavier than a digital camera. What looks like a second d-pad on the right side of the screen is really 4 individual buttons. This works surprisingly well. 2 bumpers are located topside. Controls feel solid. anyone who owned the GP2X models will be impressed that GamePark can actually make decent controls. I played Quake 2, any number of Mame and GBA games and all played really, really well with these controls. Shooters cramp your hands a bit if you have gorilla-hooks like I do. SD cards are inserted topside. The first time I inserted an SD in the slot it was a bit "clunky", it felt like something was hanging up inside, as if I had inserted the card upside down. This cleared up after the first go-round. The unit has a semi-adequate 1GB internal storage. I have an 8 GB SD that I store games on which appears to give plenty of room. Volume controls, charge port and headphone jack are located across the bottom. The battery appears to be removable. YAY! he time with the plug-in charger instead of using USB, but the maniacs at GamePark did not think including the charger was important. I have ordered one from Play-Asia and will update once it arrives. would expect from GamePark. Emulation includes arcade machines, SNES, NES, Gameboy Advance, Genesis, etc. on and on. I have found emulation to be generally faster than the F1000/2000 models. I am running the latest versions of the various emulators. Specifically GBA and MAME games run really well. I expect even better speed as the emus are optimized for the system. The games are the same stuff that GP2X's of the past have run for the most part. Warcraft, XCom, and most of the homebrew stuff returns to make an appearance -- generally running faster than on systems past. Thanks to a coding contest there is a number of new and original tower defense games. They are a mixed bag and none have really gripped me yet. Sadly Cave Story has not yet been ported and may never be due to licensing issues. A number of flash games are included and play well but I have only found a limited number of them available for download that actually work. The flash support is somewhat limited. Quake 2 now runs at a reasonable speed and supposedly can be played through to the end. The controls need a rework in my opinion, but I suppose that can be done by editing the config file (Like you could in Quake 1). There's no shortage of games for this system, but most of the best stuff is emulated or ported from other systems. I'll post updates as I get more acquainted with the Wiz. Quake 2's controls can be changed via the config.cfg file located in the /Baseq2 folder. This makes the game excellently playable. www.gp2xstore.com Buy the Wiz here.